A bacteria affecting olive trees in Italy may soon spread to other olive oil-producing countries of southern Europe, industry officials warn. The blight came from the Americas and is aggravating an already bad harvest for Italian olive growers. The bacteria, called Xylella fastidiosa, or olive leaf scorch, have affected thousands of trees in Italy's southernmost Apulia region. The microbe hampers fluid movement in affected plants, making their leaves and branches dry out and die. Insects spread the disease to new plants. According to the European Food Safety Authority (Efsa), the problem already affecting Italy may soon spread to other EU nations, unless contamination procedures are implemented. But Italian olive growers say the government will not allocate money to tackle the problem. "If it expands its range further, the entire Mediterranean basin risks being contaminated," Giovanni Melcarne, the president of an oil-producing consortium in Otranto, was quoted by The Telegraph as saying on Friday. Since the bacterium was first detected in Italy in September 2013, it has spread dramatically from 8,000 hectares to 230,000 hectares. Olive trees as old as 1,000 years, which are considered a national heritage in Italy, are affected. There is no cure for the disease and combatting it has a cost both in monetary terms and in terms of environmental damage. Stopping the aphid carriers from traveling to new areas requires creating wide stripes of ploughed soil treated with insecticides around the contaminated areas. The spread of the bacterium is facilitated by Italy's long-time tradition of planting olive trees along the roads, which now gives the infection ready routes. The Xylella outbreak coincides with a particularly bad year for Italian olive growers last year. An unusually cold and wet summer meant that olive trees lost many buds. 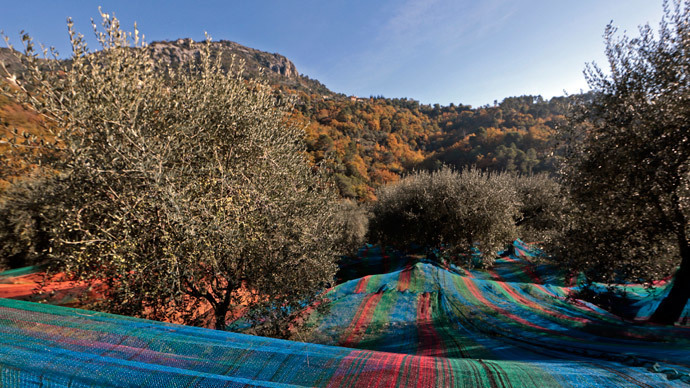 And those that managed to produce olives were attacked by olive fly, which lays its larvae in the olives. "It's a disaster of Biblical proportions," Johnny Madge, a British producer who has been making olive oil in the Sabine Hills region, north of Rome, told the Telegraph. "In this region, production will be almost zero." The harvest was the worst in decades, down 40 to 50 percent. With Italy and Spain accounting for some 70 percent of Europe's olive output, industry organizations warn of an imminent price hike.